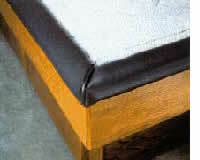 Padded rails give your wood frame waterbed a finished look and a cushioned sitting edge. The Jumbo cap has 1 1/2" of high density polyurethane foam to cover the sitting edge of your bed and extends 4" down the wood frame of your bed for a more upholstered look. The rails have a PVC extruded interior design that tightly grips the frame. Slips on in seconds, even over the liner to enhance the appearance and function of the liner. No tools needed. Choose premium grade vinyl, easy to clean nylon velvet, canvas, or a popular tweed fabric cover for your rails. Made for 1 1/2" frame width.